The relay monitors the power from the generator and in case the generator output falls below a preset value, it quickly disconnects the generator coil to avoid power from flowing into the stator coil. 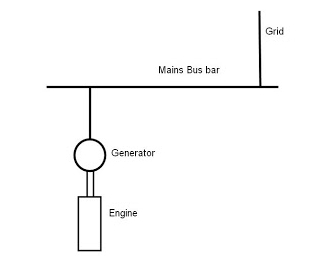 When the prime mover fails, the generator stops producing power and may instead start drawing power from the other parallel sources and start motoring. The reverse power relay senses any reverse direction of power flow and disconnects the generator to avoid any possible damage. The relay is made of a lightweight non-magnetic aluminum disc between two soft laminated iron core electromagnets, and fixed on a spindle running on low friction bearings. The upper electromagnet is wound with a voltage coil which is then supplied from one phase and an artificial neutral of the generator output. 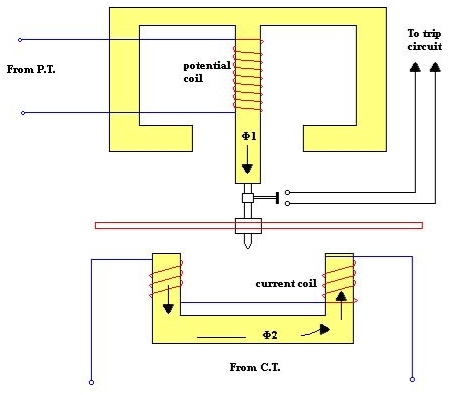 The other magnet has a current coil from supplied from a current transformer connected to the same phase as the voltage in the upper electromagnet. The voltage coil has a high inductance, designed in a way that the voltage lags the current in the coil by about 90 degrees. This lag ensures that the magnetic field generated from the current in the upper coil lags the magnetic field produced by the current in the lower electromagnet. The two magnetic fields which are out of phase, produces eddy current in the aluminium disc, and this creates a torque that tries to rotate the disc. Under normal condition when power is flowing as expected, the trip contacts of the relay are open, and the disc is against a stop. If a reverse power starts to flow, the disc rotates in the opposite direction, moves away from the stop and towards the trip contacts that activates the trip circuit. Most of the reverse power relays have adjustable settings to allow the customer do the settings according to the installed equipment. The trip point is usually adjustable to between 2 and 20 percent of the input current while the time delay is adjustable from 0 to 20 seconds. A 5 second time delay is often used to avoid tripping the circuit during synchronization. In most practical applications, the reverse power settings are between 8 to 15 percent for diesel engines and between 2 and 6 percent for turbine power movers. When power flows into the generator, it starts operating like a synchronous motor and the turbines or prime mover becomes the active load. This can damage the prime mover and is therefore undesirable. It is important to detect a reverse power condition and disconnect power as quickly as possible, and even though the gas turbines and diesel engines may not get damaged immediately, there is always a risk of explosion or fire from the unburned fuel. A reverse power relay helps in monitoring the power in the generator, it detects a reverse power condition, and the relay immediately removes the connection to the parallel utility or other power source, hence protecting the generator from damage. 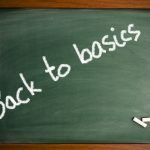 So what did you think about this back to basics on reverse power relays? Do you have any questions or information to add? Tell us in the comment below! or copy this trackback: http://engineering.electrical-equipment.org/electrical-distribution/reverse-power-relay-basics-operation.html/trackback from your own site. Reverse power relay and Watt – hour meter have the same mechanic construction,but opposite direction to operate.Reverse power relay need back ward current flow to make contact closed then trip circuit,Watt-hour meter need forward current flow to count watt hour. It’s possible to comment on digital relays and its mechanics of operation? The reverse power function is the ANSI 32 code of the protection funtions. The ANSI 37 function is similar to the ANSI 32 function, but it takes in account the magnitud of the power flowing out of generator, and trip if the value is inferior to a setting. does reverse power relay shut down the prime mover along with tripping breaker? yes ,it give signal to the governor to cut off the fuel. Thanks for the helpful post. It is easy to understand. Is it posiable to obsorb the reverse power rather than tripping a breaker with known back feed power amount ie secondary protection for a solar system 5kw. Kindly help me regarding reverse power trip.Surveyor ask’s how shall u test reverse power trip on board.He dont want to listen ‘by stimulation’.He want’s conventional method practically.Suppose i am doing it infront of a surveyor onboard.Kindly sent me the answer to my mail.